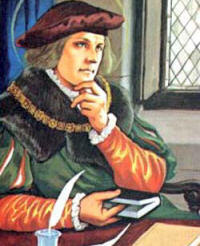 Bonfire of the Vanities: St. Thomas More wants your kids to smoke! More: No, sheer simplicity. The law, Roper, the law. I know what's legal, not what's right. And I'll stick to what's legal. Roper: So now you'd give the devil the benefit of law? More: Oh, and when the last law was down, and the devil turned on you, where would you hide, Roper, all the laws being flat? This country is planted thick with laws from coast to coast, man's laws not God's, and if you cut them down -- and you're just the man to do it -- do you really think that you could stand upright in the winds that would blow then? Yes, I'd give the devil the benefit of the law, for my own safety's sake. 1. Keep this example of loosey-goosey use of law in mind the next time someone asserts how solid President Bush is in his respect for law, the Constitution, and strict construction thereof. 2. Lest you think this an isolated example, recall how the Bush admistration came out in favor of racial preferences -- hedging, qualifying, but in favor -- rather than simply say all race-preferences in law are wrong; and recall that President Bush signed the First Amendment restricting "McCain-Feingold Campaign Finance" law, despite saying, while campaigning for President, that he was against it and it was probably unconstitutional. 3. Please note how eagerly government officials reach to use a law beyond its original intention and justification: RICO was enacted to fight the Mob; but in time, prosecutors eager to make a name for themselves, used it against abortion protesters, and now against purveyors of a -- read carefully -- legal product. 4. Please keep point 3 in mind in all disclaimers from all lawmakers and law-enforcers that their new laws will be applied in limited ways: e.g., the aforementioned McCain-Feingold assault on the First Amendment, the so-called "Patriot Act" (note: just the name of the law ought to set off warning bells -- if you're against it, you're not a patriot; since when is it treasonous to question the wisdom of legislation? ), "hate crime" laws, etc. 5. Please note the rachet effect at work: when RICO was passed, objections were raised that it might be misused; scoffing ensued. Once passed, the next step was justified on the basis of existing law. (A similar argument was used in the "Patriot Act" debate.) The underlying question -- is this good? is this right? -- was largely ignored. 6. Anyone who somehow infers this as an endorsement of, or being soft on(choose one) -- smoking, cigarette makers who do evil things, terrorism, etc., has almost completely missed the point of this entire post. Can I quibble with your characterization of Roper? The Bl. William Roper the Younger was More's son-in-law and biographer. He wasn't so much ambitious as zealous. That's an great play; have you seen the version with Charlton Heston in the title role? Oh, well, I don't really have any opinion on Blessed William (whom I hadn't heard of); I picked up the "ambitious" comment from the site where I found the exerpt from "A Man of All Seasons." Glad you offered the correction. I can't recall seeing the Charlton Heston version. I saw a version with Orson Welles as Woolsey, as I recall. Yes, the Paul Scofield version (Scofield later was the Ghost in Mel Gibson's Hamlet and the King of France in Branagh's Henry V) is good, too.